The Haro Series 1B numberplate is BACK! Newly made! 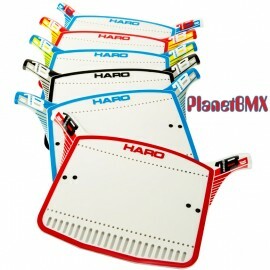 This numberplate was re-created to look 100% exact to the ones that Haro made back in the 80's! The back of the plate features a round stamp embedded in the mold "Genuine Vintage Series- HARO Since 1978-www.harobmxhistory.com". This stamp shows that this plate is a newly-made reproduction, and not one made in the 80's. Comes with velco handlebar straps on the back, just like the originals!